ABA Bank is one of Cambodia’s premier banking institutions founded in 1996 as the Advanced Bank of Asia Limited. ABA Bank is now a multi-branch network universal commercial bank offering a full range of products and services to all Cambodians. Here at ABA Bank we are always looking for Competence and Ambition candidates to join our team. Client Acquisition Trainee is responsible for achieving branch sales targets by providing customers with an easy and friendly banking experience, which identifies and meets customers’ transnational and sales needs. Make customer presentations and Identify sales opportunity for new business for new customers. Contribute to the development of sound profitable business by continuing on-board new customers and increasing the customer’s portfolio. Agree challenging daily, weekly, and monthly targets for yourself with your branch manager/ head of department. Regularly evaluate these targets – when results fall short of target, understand why and agree what to do differently to improve performance with your line manager. Keep up to day with ABA’s products suite and marketing campaigns to ensure superior product knowledge. Ability to work effectively in a team environment. Sales, negotiation and relationship building. Micro Business Loan Trainee is responsible for processing and analyzing Micro Business Loan applications and conduct credit investigations, reports and more. All Phnom Penh and Provincial Branches (100 posts). Analyze and interpret financial statements of the business in order to access the repayment capacity and financial soundness of the borrowers. Responsible for processing registration of title deed at local authorities and Land office. Minimum High School graduated, under graduated, Bachelor Degree of any related fields. One (1) year working experience in selling/any related fields is a plus. Presents high attention to details. Has a good understanding of banking products and service/lending part is more preferable. Computer skills: MS. Word & Excel. Be able to travel based on location set. S/he is responsible for solving any sorts of dispute occurring on debit or credit cards of the customers, merchants, and ATM terminals. Besides, s/he has to deal with embossing cards and other tasks assigned by manager. 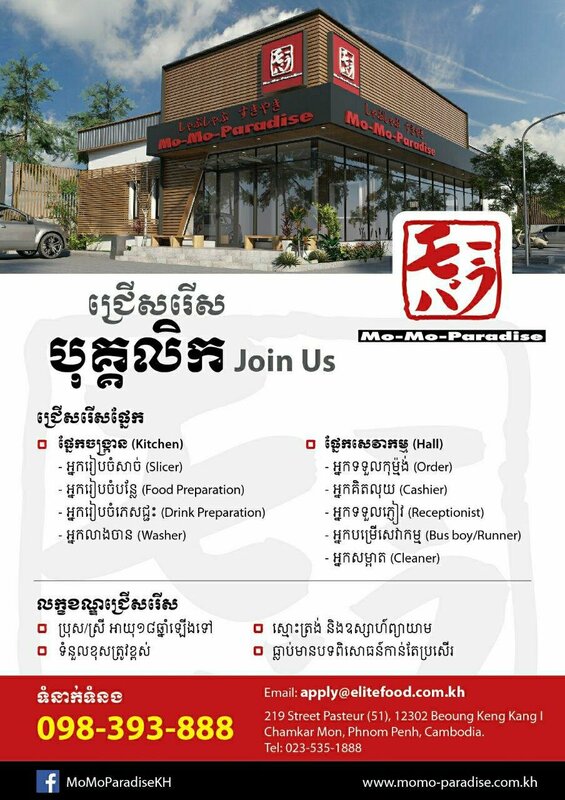 Head Office, Phnom Penh (4 posts). Check daily suspicious card transactions and notify cardholder(s) about those suspicious transactions in a timely manner. Follow up with Client Service Advisor or contact customer directly so as to inform them about dispute resolution cycle or ask for information and supporting documentation. Control and monitor embossers and printers in terms of status, operation, connection and other support. Report immediately on any urgent case(s) which needs to be fixed to comply with bank operation or fulfill customer needs. Learn and Adapt to Operating Regulations set by each International Payment System. Bachelor’s degree in banking and finance, English literature, or equivalence. Knowledge of banking operation, e-banking features and components. Basic knowledge of information technology. Good interpersonal skills and communications skills. Good at written and spoken English language. Good conceptual, organizational, analytical, and problem-solving abilities. Strong abilities to work as a team member. Ability to work independently and have participative involvement in developing new initiatives. This role is responsible for manage ATM hopper in transit, collection cash from Cash-in Kiosk machine and ATM/CIM error. Duties may include supporting senior officer and supervisor for verifying actual cash with receipt ATM and Cash-in Kiosk machine and sort new bill for ATM. Sihanouk Ville Branch (1 post). Ou Baek K’am Branch, Phnom Penh (1 post). Load cash to ATM cassette after verifying and run with machine. All ATM cash refill are recorded serial number and correct amount in hopper. Manage ATM hopper in transit. Support to ATM cash management supervisor for verifying actual cash with receipt of ATM remaining. Monitor ATM error and collect the reason of error, ATM maintenance and ATM removing. Make sure ATM hopper input with the right position. Run & verify cash from ATM/cash-in Kiosk machine with senior officer at office. Collect cash from cash-in Kiosk machine. Monitor Kiosk error and collect the reason of error, maintenance and removing. Sort new bill for ATM. Another task assigned by supervisor/ manager. Completed high school or bachelor’s degree in business, Finance and Banking, Accounting or any related fields. High attention to details and accuracy. Acceptable written and verbal communication skills (Khmer and English) Good computer literacy. Teller is responsible for handling customer transactions at banks, including taking deposits, disbursing cash, opening accounts, and investigating fees. Sothearos Branch, Phnom Penh ( 1 post). Sonthor Mok Branch ( 1 posts ). Handle cash for all the transactions. Be Confidential with the customer’s balance or other transactions. Provide a comfortable way for customers with the bank services. Check the closed balance with cash on daily basis. Bachelor’s degree in finance, accounting or other relevant fields. Minimum 1-year experience of relevant experiences in customer services or other front-line role. Ability to accurately and efficiently process cash transaction. Good planning, problem solving & organizing skills. Computer skills in Ms Word, Excel, PowerPoint, etc. Good command in spoken and written English is required. Senior is responsible for supporting supervisor to manage all Teller positions to ensure the efficient and effective operation of the teller line. Duties may include a contribution towards assigning workflow, training news tellers or poor performing tellers if requested, monitoring customer service, and ensuring Tellers’ duties are in conformance with established procedures. Kampong Speu Branch (1 post). Perform all functions as detailed in “Performance Section” of Teller’s Position Description. Executes an extensive variety of customer transactions both on paper work and system in accordance with Bank policy and procedures. Monitors and maintains branch cash levels and prepares related reports as needed. Oversees the execution of daily banking procedures as related to teller line and ATM (if ATM is placed under branch’s responsibility). Demonstrates excellent telephone etiquette, communication abilities, and customer service skills to promote positive image for the Bank and promote and maintains excellent level of customer service from all tellers. Act as key point together with Teller Supervisor for tellers to look for support to resolve complex transactions and in assist with difficult customer requests. Minimum 2-year working experience as Teller (prefer outstanding staff). Acceptable written and verbal communication skills. Attention to details and accuracy. Branch Cash Management Officer is responsible on delivery cash from/to within branches, from Nostro account of other bank for cash transaction, and Keep branch’s cash transit form in folder by date. Head Office, Phnom Penh (1 post). Delivery cash from/to within branches after making sure that the cash must be transferred the same as amount request or remit. Delivery from Nostro account of other bank for cash transaction. Keep branch’s cash transit form in folder by date. Checking actual cash amount with by branch. Provide superior customer service that will satisfy our customer/staff and make them loyal, using ABA’s service standard as a reference point at all the times. Another task assigned by manager. Bachelor’s degree in business administration, Economic Sciences or any related fields. Acceptable written and verbal communication skills (Khmer and English). District Operations Officer is responsible for maintaining day to day financial, accounting, administrative and personnel services in order to meet legislative requirements and support municipal operations. And, this role is also responsible for evaluation, authorization, or recommendation approval of commercial, real estate, or credit loans; advise borrowers on financial status and methods of payments including mortgage loan officers and agents, collection analysts, loan servicing officers, and loan underwriters. Moung Ruessei District Branch ( 1 post ). S’ang District Branch ( 1 post ). Handle leave form of all staff. Collect all assets from staff resigned. Check voucher from Operation Department. Prepared voucher in order for Accounting Department. Prepared Cash record and verify with Chief of Teller. Daily report: Deposit, Other Transaction review, Cash reconciliation, Customer report, General information. Monthly performance report: income detail, deposit portfolio and loan portfolio. New Account Opened during the Month and Outstanding Balance by end of Month Report. Do financial report: profit and loss statement, balance sheet, and summary report. Handle some tasks from Branch Manager when he/she was absent. Vehicles, maintenance & mail delivery. Process the credit cases of Micro Business Loans to head office. Monitoring and following up next settlement dates and expiry of Micro Business Loan and ensuring timely settlements . Controlling and monitoring Credit Committee Resolution. Preparing legal documents for loan approved from Head Office. Ensure safekeeping of all the documents related to the approved loan i.e. loan application, collateral/securities documents submitted by the borrower in the vault after recording of the particulars in the respective vault register. Coordinate with credit administration officer at head office to monitor the expiration of insurance policies. Coordinate with client for review of loans, insurance renewal, legal documents, etc. Copy and scan documents to HO. Follow up approval cases with HO. Support MBLO on process of Legal Documents. All legal documents keep at Vault properly. Follow up with clients about expire insurance. Bachelor degree in the field of banking and finance, accounting, economic, law or other equivalent. 1 year experience in Accounting, Finance, administrative job; preferably in Micro Finance Institutions or bank. Have strong numeric and administrative skill. 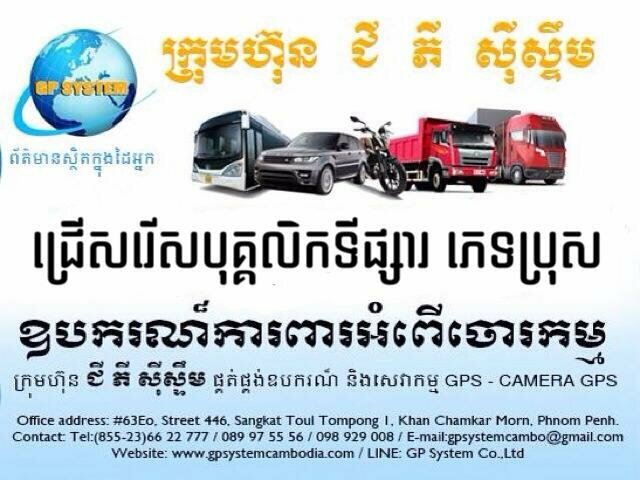 Good command in Khmer and English. Computer literacy: Ms. Word, Ms. Excel, Internet and Email. This Position is to facilitate recruitment active for specifically vacancies on Telling’s Area for branch /Dept. and manage branch’s performance transactions by follow up day to day the recruitment process as well as control department stationary and file document. Head Office, Phnom Penh (3 posts). Conduct interviews with HR team by analyze & discuss to get an efficient work force whereas selecting the quality candidate of Telling’s Area and fulfill document with manager’s approval and submit to HR by timely. Monitor branch’s performance transaction by tracking the volume of transactions with the goal of enhancing productivity service and resource for improving business process/operational. Give an advice to Teller’s Area Staff for improving staff performance and motivation. Follow up branch’s recruitment process for maintain branch’s resource as well as serving the product services efficiency to customer. Daily report to manager of any issue for fulfill the weakness resolution while requirement need for business purpose. No complaint from branches/dept. of recruitment process of unqualified candidate of Telling’s Area. No complaint from branches/dept. of staff performance transaction and resource. Ex: View Teller’s transaction for analyze to increase staff or counter advice operation staff while meet the issue for improving the business process. Bachelor’s Degree in finance Banking, Accounting, or other related fields. Experience 1 year in human resource/ Teller is preferable. Understanding of basic banking products and services is preferable. Practical knowledge of operational risk and compliance with policies and procedures applied in Banking Industry is an asset. Good in Computer Literacy (Microsoft Office). Good in written and communication both in Khmer and English. Planning, Organizational time management skills. This position is to manage cash service management team of fund services across the branches, as well as control cash of ATM service and CIM encasement on bank’s public holiday and at night shift by complying with the policy and procedure of Cash Service Management. Work closely with Card Center Division for ATM upload, Error and CIM Encasement for achievement excellent service quality by 24/7. Review ATM Report in order to arrange ATM upload for delivering 24/7 ATM service. Verify cash into ATM Cassette for genuineness, numeric, the accuracy of Serial Number Record report, Label ATM Number, secured by security seal to manage operational risk. Review CIM Report in FT in order to encase CIM for providing excellence service 24/7 of cash deposit via CIM. Verify cash remaining from ATM and CIM with ATM and CIM Receipt to manage cash shortage or surplus. Seek approval from Treasury Department for all Fund Movement to/from branches. Manage team for fund from head office to all branches in Phnom Penh to support branches cash flow. Manage team for remitting fund remit from branches to head office for controlling branches over vault limit balance. Report Immediately to management of any issue to get proper support and best solution. Ensure ATM Key is well controlled and managed without any losses. Coaching and lead staff to control operational risk of cash loss/shortage. Ensure the process of cash in transit from head office to all branches in Phnom Penh, ATM Upload, CIM encasement is run smoothly complied with bank policy & procedure. None complaints from customer/Branches of cash service/ATM/CIM on bank’s public holiday. No complaint/Zero error from Branches on upload and refill cash to ATM Cassette. No complaint on CIM encasement/cash delivery from clients/branches. Ex: client cannot deposit cash into CIM. Or cash delivery is not on time to the branch. No complaint on Currency Note from branches/clients. Ex: old note or stain note. No complaint on Counterfeit Note of cash service ATM. Bachelor’s Degree in finance & Banking, Accounting, or other related fields. Experience 2 years in Cash Management and ATM/CIM is preferable. Planning, Organizational & time management skills. Application Development Officer is responsible for any new development of internal banking applications and reports, documentation and user manual. And, shall be reporting to Head of banking apps/reports development unit. Analysis of options available for development and discussing them with the team. Prepare or create data environment if necessary to support the process of development. Prepare of development plans for received requests. Develop of applications and reports based on requests from each department by using PL/SQL code. Testing developed apps and reports involving department users (UAT). Prepare list of developed apps and reports with status of development. Prepare of user manuals and handling over to respective support teams and documentation of processes of development. Perform other tasks which will assigned by line manager. Bachelor’s degree in information technology or Computer Science. Must have experience in application or report development/customization; NET/SQL/PLSQL experience. Must have experience working with function, procedure, package and have a good understanding of OOP. Willing to research/learn new technology. Be flexible, honest and punctual. Willing to work as a team. Good communication skills in Khmer and in English. S/he is responsible for daily troubleshooting and maintenance of all bank’s servers to ensure bank’s servers serving 24/7 by using redundancy schema. In addition, s/he is in charge of preparing performance report weekly, monthly making backup of all servers, applying update patch to safeguard security breaches. Furthermore, preparing list of spare equipment stored in the bank for replacement purposes in emergency. Keeping all bank’s servers serving 24/7, using redundancy schemas for all servers. Making backups of all servers based on schedule approved by CTO. Report of backups made shall be sent to CTO each Monday for past week. Monitoring and maintenance of uninterruptable power supply of server rooms of the bank. Maintaining UPS replacement schedule due to aging of UPSs. The schedule shall be reviewed annually and approved by CTO. Weekly testing of take over generator. Such test shall be done weekly in cooperation with administration department. The test report shall be sent to CTO. Reviewing list access cards allowed entering server rooms of the bank in cooperation with security department. Review report shall be done monthly. Review report shall be sent to CTO. Organization of “Support team” to communicate with other IT units of the bank over their requests. Bachelor’s degree in information technology, Computer Science or related field. Minimum of 2- or 3-years’ experience as System Administrator or in banking sector. Holding system administrator certified associate is preferable. Be honest, quick learner, flexible and punctual. Willing to learn new technology and more self-motivation and self-study. Strong interpersonal skills and communications skills (oral and written) in English language. Excellent conceptual, organizational, analytical, and problem-solving skills. Ability to collect operational data, establish facts and draw valid conclusions as well as formulate ideas and recommendations. Note: For more vacancies please visit our website: www.ababank.com if the above job advertisement doesn’t meet your career goal.